Earth Week at Bellevue College! April 22nd to 26th! Celebrate Earth Week April 22nd – 26th! 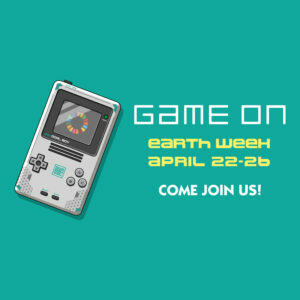 The Office of Sustainability is hosting BC’s annual Earth Week on campus from April 22nd to 26th! It will be a week of FREE events that includes speakers, workshops, a farmer’s market, an art gallery, and much more! Be sure to join us and participate in all these fun and exciting events! View the poster: Earth Week Poster 2019. This year’s theme is Game On: Bellevue College Addresses the United Nation’s Sustainable Development Goals. These 17 goals set forth by the United Nations are a call to action for all countries in order to promote prosperity while protecting the planet. The goals cover a wide breadth of issues our world faces including poverty, education, climate change, social justice, while also recognizing each goals interconnectedness. By using these goals as guidance to promote positive change, it’s not game over for our plant, it’s GAME ON! A special thanks goes out to the Student Environmental Sustainability Fund for funding Earth Week events. Other thanks go to BC staff for helping coordinate and run sessions during the week: Rick Glover, Nicole Arroyo, Nancy Lane, Brandae Grein and the XR Lab, Roshni Tewari, Russ Payne, Christina Sciabarra, Michael Hanson, Sapan Parekh, Wendy Pickering, Peter Prescott, Rachel Lowe, and Grounds Crew. We greatly appreciate each and every one of you! We have an awesome lineup of speakers, workshops, and documentaries for you to enjoy. Please take a moment to learn more about our speakers and read their bios HERE! Please continue to check back here as the schedule is subject to change. Electronics (FREE) with Interconnection! Donate your personal broken, old, or electronics you just don't want anymore! Local company Interconnection will recycle your old electronics in a socially and environmentally friendly manner, ensuring any data on the device is securely removed or destroyed. NOT Accepted: CRT Monitors, kitchen appliances, garden tools, hand tools, or bathroom appliances. ONLY PERSONAL ITEMS- All BC electronics should be brought to IT to be processed/recycled/surplussed, Room A109 or 425-564-4357. Monday April 22, 2019- Earth Day! All Day Event: Bike Mobile Come visit BikeWorks Bike Mobile and get your bike fixed up for free (labor included, parts may be extra). All Day Event: Bike Demos Learn about electric bikes and bike share programs, while also getting to test out different electric bikes in a safe and supportive environment! 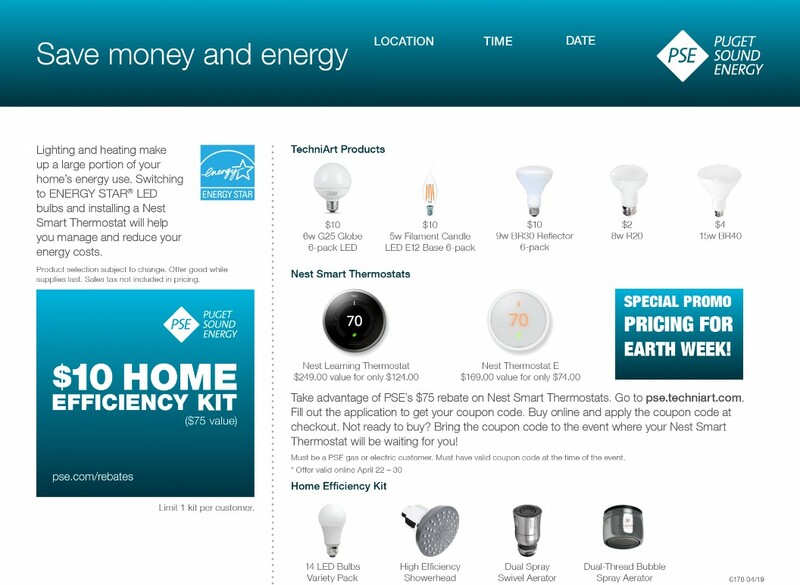 All Day Event: Puget Sound Energy Lighting Fair Learn ways to be more efficient and save money in your home! Purchase an energy saving lighting or water saving kit! Nancy Lane's Earth Day Presentations and Climate Commitment A class presentation on environmental and social justice issues, and the making of a climate commitment poster with actions to take! Wilder Than Wild: Fire, Forests, and the Future. View this one hour documentary about how forest management and climate change is exposing Western wild lands to large, high intensity wildfires, while greenhouse gases released from these fires contribute to global warming. Combating Diseases in a Warming World As climate change shifts the endemic regions for many diseases to which we currently have no vaccines, there is an urgent need to develop new drugs to treat these diseases and to utilize next-generation vaccination methods to prevent the diseases. Join BC's Nicole Arroyo and learn about the future of host-pathogen defense and join the discussion to see what you can do to help these efforts. Environmental Racism Workshop Join BC's David Spataro as he introduces participants to the issue of environmental racism and provides some historical background on the social struggles and thinkers that established environmental racism as a significant part of the environmental movement. Exploring Sustainability through Virtual Reality Join BC's XR lab to discuss how virtual reality can help foster sustainable actions. During the presentation, attendees will get to try sustainability focused VR for themselves! It's an interactive and immersive session where participants will personally experience what our planet and our future looks like through this amazing technology. Crafting for People Experiencing Homeless: Sleeping Mats made of Plastic Bags Come join Sapan Parekh, of the RISE Learning Institute, in converting plastic bags into a bedroll for people experiencing homelessness. Must be able to use scissors, but no other skills required. A joint project between the Office of Sustainability and The RISE Learning Institute. From Trash to Treasure: Junk Journaling Workshop Learn how to keep things out of the landfill, by turning old items into new, creative, and useful objects. Join Seattle Recreative and make your very own journal from a variety of repurposed materials. Game On Gameshow BC's Rick Glover is hosting an interactive "pub trivia" style Gameshow about the United Nations Sustainable Development Goals and how BC can lead the way for a prosperous future. Learning at the Edge of the Apocalypse: Understanding and Addressing Uncomfortable Emotions around Climate Change Join UW Tacoma's Ellen E Moore to discuss the feelings around living in a time where climate change and other environmental impacts seem inevitable. Talk through your emotions, learn ways to cope, and find solutions. Restoring Traditional Lands of the Snoqualmie People David Steiner who manages the Snoqualmie Tribe's habitat restoration and monitoring program will talk about the Tribe's efforts to protect fish habitat, wildlife habitat, culturally significant native plant communities along with also maintaining the Snoqualmie and Sammamish River watersheds that are important to the Tribe. Backpacking 101 Want to explore all the wilderness that Washington has to offer? Peter Prescott of BC's Wellness Center will give an introductory lesson on backpacking and give you all the tools you need to feel comfortable and confident to hit the trail! Climate Change vs Nihilism BC's Russ Payne will dive into how climate action and living sustainably can help people find deeper meaning in life. Run time 1 hour 30 min. Conquering Mt. Trashmore: A Waste Audit BC's fourth annual waste audit, come learn the proper way to sort recyclables and compostables and learn about waste management! All Day Event: Farmer's Market Annual produce stand, seed swap, plant sale, tabling, and other local vendors. Come meet local growers and makers, educate yourself about organics and locally grown produce, and get your fridge and garden filled! Come learn about great causes and opportunities to volunteer! CASH ONLY for produce stand and plant sale, other vendors take cards. Remember to bring a reusable bag if you can! Sustainable Seattle: Exploring the Bullitt Center and Capitol Hill's Eco-District BC student Rodrigo Cachay will talk about the famous Bullitt Center in Seattle and BC student Mitra Torshizi will talk about sustainable cities and Capitol Hill's Eco-District. King County's Local Food Initiative Mike Lufkin, a local food economy manager who oversees King County’s Local Food Initiative, will discuss how this program aims to build a stronger farm-to-plate pipeline in our region by connecting local farmers to consumers, increasing access to healthy and affordable foods, supporting farmers, protecting farmland, and creating food systems that are resilient to climate change. Biomimicry: Innovation Inspired by Nature Organisms have been solving problems since the beginning of life on earth. Jennifer Barnes AIA, LEED®AP of 55-5 Consulting explores how we can learn from nature and apply that knowledge to finding solutions to real world problems. Learn about biomimicry, which is the design and production of materials, structures, and systems that are modeled on biological entities and processess, and how it is being used to improve urban life in this engaging and informative presentation. PSE Is Going Green Join Puget Sound Energy's Wendy Weiker as she discusses green energy and how PSE is joining the movement. Plant ID Walking Tour Come take a tour of campus with BC's Michael Hanson and learn about all the plants that live here! Living on One Dollar Documentary Watch as a group of friends try to live on $1 a day in Guatemala, a reality for over 1.1 billion people around the world. Student facilitated discussion on the issue of climate change as a driver of the Central American migration/caravan to the U.S. border and on the conditions and impacts of poverty. Run time: 56 minutes with discussion to follow. Eating Animals is an urgent, eye-opening look at the environmental, economic, and public health consequences of factory farming. Tracing the history of food production in the United States, the film charts how farming has gone from local and sustainable to a corporate Frankenstein monster that offers cheap eggs, meat, and dairy at a steep cost: the exploitation of animals; the risky use of antibiotics and hormones; and the pollution of our air, soil, and water. Field Trip to 21 Acres Join us for an exciting field trip to 21 Acres, a sustainable farm in Woodinville, Washington. The day will start with a tour of the farm and discussions around sustainable agriculture and climate change. Next up is a tour of their Green Building (LEED Platinum certified), where we will get to see the innovation that makes it have less impact on the earth. Lastly, we will be learning how to make a vegetarian meal using fresh, local, and sustainable ingredients. Get hands on experience prepping and cooking your own healthy meal, followed by the best part...taste testing your hard work! Limited space available! Signup required. Free transportation to/from campus. All Day Event: Fix-It Fair Avoid the landfill and the cost of buying a new item by bringing in your broken items to get repaired for FREE! Examples of items to bring in include clothing, lamps, small appliances (fans, electric heaters, vacuums, small kitchen appliances, etc. ), electronics, and pieces of furniture! Please be aware this is volunteer run and not everything can be fixed. All Day Event: Electric Vehicle Car Show Come check out some electric vehicles including Teslas, Volts, & More! Special thanks to the Seattle Electric Vehicle Association. Composting 101 Learn about all the wonderful benefits of composting with Cedar Grove and ask any questions about what can and can't be composted. Yoga Come get your yoga on with BC's Rachel Lowe, in this unique opportunity to see the skyline and breathe fresh air on the Student Housing patio! Bring a mat and a beach towel (extra mats and space are limited). Will be indoors if inclement weather. Meditation Join as a follow up to the yoga class, or as a stand alone class. Find inner peace and relaxation. Green Cleaning Workshop Learn how to make your own natural cleaning products in this hands on class. Each participant will come away with their very own "Green Cleaning Kit". Rain Garden Work Party Join the BC Grounds Crew in beautifying the Student Housing Rain Garden. We will learn about how rain gardens work, remove invasive species, and enjoy a day outside! Please wear clothes for gardening! Costa Rica Health, Wellness, and Sustainability Listen to students talk about their travels to Costa Rica and what they observed about sustainability there and how the lessons learned can be applied to Bellevue College. Students discuss how they explored a highly biodiverse Blue Zone society that focuses on nine attributes for wellness. Health promoting and health inhibiting lifestyle practices are studied and compared to the United States. Factors such as socioeconomic status, nutritional habits and sustainable environmental practices are identified and applied to their project-based outcome.